j4ab | Justice 4 Alan Blueford! The Justice 4 Alan Blueford Coalition[i] was created after the death of 18-year-old Alan Blueford at the hands of Oakland Police Officer Miguel Masso on May 6th, 2012. Eight months after Alan’s death, investigation reports have not yet been completed, Officer Miguel Masso remains on paid leave, and justice has not been served. We seek redress for these wrongs. The Justice 4 Alan Blueford Coalition has made specific demands[ii] of Oakland and its Police Department regarding Alan’s death, two of which are directly in your purview. Officer Miguel Masso be fired from the Oakland Police force. The de facto ‘Stop & Frisk’ policies of the Oakland Police which ultimately resulted in Alan Blueford’s death be terminated immediately. We note that the refusal of the Oakland Police Department to even consider these demands is evidence that they have no commitment to enforcing their own policies and are uninterested in fulfilling their obligation to protect the safety and civil liberties of those they interact with. Therefore we believe you need take action on these demands, and we request a face-to-face meeting with you as soon as possible to discuss these issues and other concerns we have about the Oakland Police. he is not psychologically fit to be a police officer, as evidenced by his own statements in the District Attorney’s report[vi]. This language by necessity directs that the Compliance Director act to intervene where the OPD has, through its actions or omissions, failed to be in compliance with the professional standards set forth in the Complaint that led to Judge Henderson’s Order. The Compliance Director must stop OPD’s racially motivated de facto ‘Stop & Frisk’ policies. 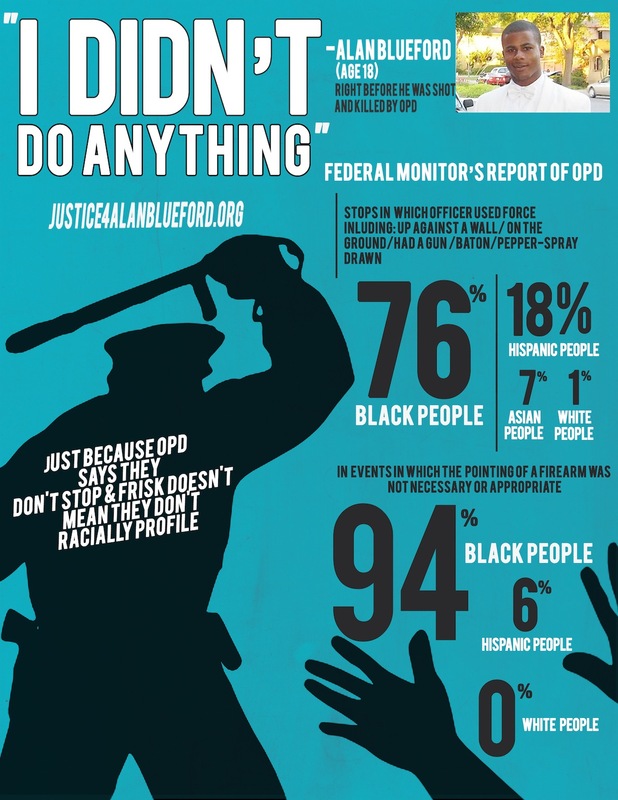 Alan Blueford is dead because of racial profiling. The D.A.’s report and the officer’s statements therein are full of the racially biased codewords officers use (e.g. “baggy pants,” “waist band,” “hoodie”) to create “reasonable suspicion” for the stop of Alan and his friends. Unless these practices are forbidden and violations sufficiently punished, police will continue to use any and every excuse to stop young men or color and terrorize them. Unless these policies are ended, more deaths like those of Gary King[ix] and Alan Blueford will inevitably happen. Unless these policies are ended, there will never be any possibility of community cooperation with police. The Compliance Director must be the one to promulgate and implement policies which put an end to OPD’s de facto ‘Stop & Frisk’ protocols. OPD has shown that it is incapable of following its own best procedures and practices, let alone implementing additional ones. OPD has gone out of its way to hire as a consultant someone who believes that ‘Stop & Frisk’ is an effective policy tool, in direct opposition to Judge Henderson’s order and the Negotiated Settlement Agreement. “Within 60 days of his or her appointment, the Compliance Director will file a list of benchmarks for the OPD to address, resolve, and reduce… (2) incidents of racial profiling and bias-based policing;”. We urge the Compliance Director to examine New York City’s proposed Community Safety Act[x] for ideas on how to create a constitutional environment for policing that will stop racial profiling and de facto ‘Stop & Frisk’ actions on the streets of Oakland. We encourage you to review Floyd v City of New York[xi], the ongoing lawsuit to curtail ‘Stop & Frisk’ in New York City, and to take note of the recent Federal District Court order instructing NYPD to cease and desist its ‘Stop & Frisk’ policies in and around private apartment complexes[xii]. Thank you for your time. We looking forward to meeting with you to further discuss how the civil rights of Oakland’s citizens can be protected and how Justice 4 Alan Blueford might be obtained. To contact us please call (510) 839-1200 and ask for Anne Weills or Dan Siegel. The Justice for Alan Blueford (JAB) Coalition. We call upon you as the Attorney General for the State of California to prosecute Oakland Police Officer Miguel Masso for the murder of Alan Blueford. Alan Blueford was 18 years old and was about to graduate from Skyline H.S. in Oakland. Just after midnight, on May 6, 2012, Alan and two of his friends were waiting for some girls to pick them up on 90th Ave, when a car slowly pulled up with its lights off. It was an OPD vehicle. Alan ran. OPD Officer Masso gave chase. A few blocks later, Alan was shot and killed by Masso. Masso also shot himself in the foot. Over a dozen witnesses said that Alan had no weapon and posed no threat to the officer. Alameda County District Attorney Nancy O’Malley is derelict in her duties with respect to the Oakland Police Department. Despite the findings of continued non-compliance of the OPD by Federal Monitor Robert Warshaw, O’Malley has functioned as a rubber stamp for the OPD. She has failed to charge a single OPD officer for any criminal wrong-doing. Specifically on the killing of Alan Blueford, our coalition did a thorough analysis of the DA’s findings and found them to be biased, unprofessional and extraordinarily selective in its use of witness statements. “ALAN BLUEFORD SHOULD NEVER HAVE BEEN STOPPED. “THE USE OF DEADLY FORCE BY OFFICER MASSO WAS UNJUSTIFIED, BECAUSE THE EVIDENCE SUGGESTS THAT ALAN BLUEFORD DID NOT HAVE A GUN WHEN HE WAS SHOT. We also call on you to reopen all the cases of OPD officer-involved shootings from the Riders case in 2003 to the present, due to the pattern of flawed and biased investigations which has shown an unprincipled relationship, lacking objectivity, between the D.A’s office and the Oakland Police Department which continues to lead to OPD officers being unjustly cleared and immune from criminal charges for brutality and murder. Finally, we demand that you create a strategy and policy to end the criminalization of the Black and Brown Communities, stop the militarized Oakland Police Department from terrorizing Black and Brown Communities, and allow the Black and Brown communities of Oakland to exercise their right to political, social and economic self-determination. We are holding a rally on Tuesday, March 5th at 3pm at Nancy O’Malley’s office at 12th and Oak St in Oakland. We demand that you announce the prosecution of OPD’s Miguel Masso for the murder of Alan Blueford.